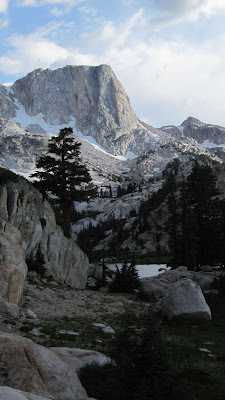 Just got back from seven days of bliss in Northeastern Yosemite and the Hoover Wilderness—on the Twin Lakes to Benson Lake and Matterhorn Canyon loop. This is one to put on your list: great scenery, some really fun fishing, and by doing it in seven days, we managed to give ourselves plenty of time to enjoy the whole thing. We left Twin Lakes Resort (Pay $10 to park your car there for a week) about 11 a.m. and it took us most of the day to get to Peeler Lake. The first few miles are pretty easy, but the last few up to Peeler are tough, especially for a first day on the trail. Camped by the lake and were later joined by a troop of By Scouts doing the same hike. Sigh. They were well behaved, especially after I asked them to quiet down once, but it wasn’t quite the solitude we were seeking. Mosquitoes were not bad (3/10), but I saw only very small fish in the lake, so didn’t bother unpacking the rod. Left early the next day and walked down into Yosemite National Park and through Kerrick Meadow---a simply stunning open alpine valley with huge chunks of granite on all sides. We loved every minute of this part of the hike, even running into ANOTHER group of scouts heading the other direction. We also met three young biologists from the NPS who were surveying alpine mammals, and not finding much,. But the skeeters were finding them! We were interested in their mosquito clothes…shirts and pants that were bug netting. We had lunch at the last contact with Rancheria Creek, and I fished for about 45 minutes, catching and releasing a nice selection of trout of all sizes. Really fun. The climb up over Seavey Pass is quite steep but short, and the broken terrain across the top of Seavey has some lovely lake---next time I think we would camp here instead of Benson. And we ran into four middle-aged guys, one of whom was wearing a bear bell! From there we dropped down 2000 feet into Benson Lake—a long, hot, steep trail with lots of rough boulders and bad footing. This was our least favorite section of the hike. Got to Benson in time for cocktail hour, and set up camp. Twenty minutes later the same troop of Boy Scouts arrived, and set up just a campsite away. They actually came over and apologized….sigh. We were tired, and didn’t want to move again. But with about six other groups at Benson ( including a troop of Girl Scouts as well! ) this lake was our least favorite spot on the trip. Yeah, it has a beach, and warmer water. But it also had too many people. And the swamp you walk through to get there was about 8/10 on the mosquito scale. Thank God the wind blew all night long, keeping them to the east of us. In the afternoon I took a stroll up to Surprise Lake—a lovely walk over some long granite ramps and then through a collection of small lakes and pools. The views off the southwest side of Surprise Lake were really wonderful. On the way back I climbed up the little knoll southwest of these lakes, and overlooked all of what we had hiked in the last couple of days. Very nice. With four nice 11-12” rainbows, this was one of the really nice spots on the trip. The next day we were up and over Benson Pass, and then down into Wilson Creek. Like all three of the higher passes on this trip (Benson, Burro and Mule Pass are all over 10,000 feet) this had a beautiful microclimate that charmed us—lots of flowers, small benches, and tiny canyons full of great scenery. Wilson Creek was crawling with trout, but we didn’t stop to fish. Instead, we made it down into Matterhorn Canyon by lunchtime. There we stopped and enjoyed fishing (excellent! ), reading, and a visit with an NPS staff member, before heading up the canyon to find a spot to camp. We loved this day’s hike. The further up Matterhorn Canyon we got, the better the scenery became. Quarry Peak soon dominated the west side of the canyon, and when we got past it, the Sawtooth Range came into view. Unbelievable. We camped there, and I caught more fish in 90 minutes than I would have thought possible. All brookies, between about 5-9 inches. What fun. And sunset, as the peaks slowly turned pink, was better than any TV show. Next morning we were up relatively early, and hiking up the canyon and over Burro Pass. This is a great hike, as each step opens up more vistas over the Whorl Mountain and Matterhorn end of the canyon. Once on top we celebrated with a photo, then worked down into Piute Canyon. Snow here was visible, but not really an issue—we skirted anything that looked too dicey. 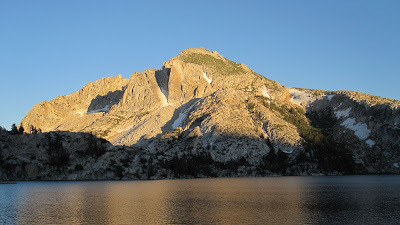 We ran into quite a few young climbers doing the Sierra Challenge—the peak on that day was Finger Peak—so the place seemed full of day hikers racing up and down trails, peaks, scree. But they were all very friendly and perky—I wonder how they felt after day nine or ten of this challenge! Camped down in Piute Canyon, where the brookies were very wary—but I still caught a couple of nice 8-9 inch ones. This was really challenging fishing—the perfect contrast to the day before. That night the skeeters were out in force—M finally put on her head net after dinner, and they encouraged us to hit the tent early. Day six took us up over Mule Pass and back into the Hoover Wilderness. 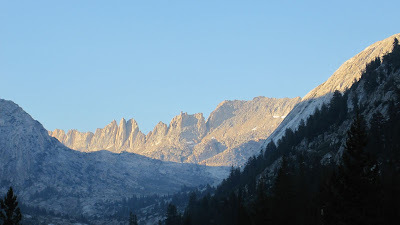 We absolutely loved Mule Pass—a twisting little trail that leads quietly through some of the most intimate scenery in the Sierra, interspersed with views over all of both Piute Canyon and the Sawtooth Range/Matterhorn Peak. Yeah. It was steep and high, but a great WALK as well. Once over the pass, we were grateful that we were going this direction, as the other side is less scenic and far tougher. Within a couple of miles we were down at Crown Lake, where we camped and thought we’d take another half-day to fish and relax. Not quite. Fishing was poor—only a few little brookies. And by 2:30 or so it had clouded up and started to rain. So we hopped into the tent and took a delightful nap. But after the rain the bugs were positively fierce. This lake has one of the great views of all time, but we just couldn’t enjoy it through the headnets. Again, we headed into the tent early. A light rain shower visited us during the night, and we were up early the next day to hike out to Twin Lakes. By the time we got to Barney Lake (9:30 or so) the trail was already full of day hikers and backpackers on their way in. We loved the scenery on this trip, and the fishing was fun, but there were just a few too many people for our taste. Still, if you haven’t done this trip, you should. And we would go back to Matterhorn Canyon in a heartbeat.